Soil: These vines are planted on an exceptional hillside coveted since the Middle exposition provides constantly sun. The soil is entirely covered by granite “2 micas”, which provides heat to the grapes also during the night. The slopes are very steep. All these conditions make that this vineyard is classified in “Alsace Grand Cru”. Winemaking method: the grapes are harvested by hand, and the whole berries are pressed. Traditional fermentation through temperature control process, and ageing in vats. Color: yellow-gold, with a perfect brightness. In the nose: a tender but expressive bouquet, with aromas of violet and spices. In the mouth: the palate is fat and well-balanced. The initial exotic fruits aromas are followed by nuances of roses, pine and ginger. 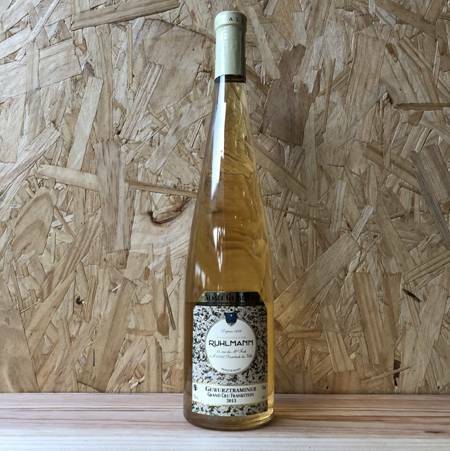 An exceptional Gewurztraminer Grand Cru, which is a marvelous aperitif or dessert wine, and will harmoniously pair with “foie gras” and the finest cuisine. The label is a photographic reproduction of the Grand Cru granite soil (this wine is in a white bottle, to show its nice colour).